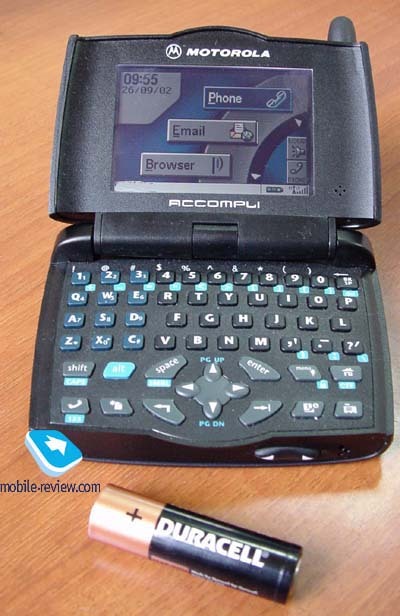 We decide to publish only a short review of Motorola Accompli 009 here. On the one hand, this phone has been already produced for a long time, on the other hand, there are no official lots in our country. We'd like pay attention only on the main features of this device, which will help you to decide whether you are interested in purchasing this phone or not. 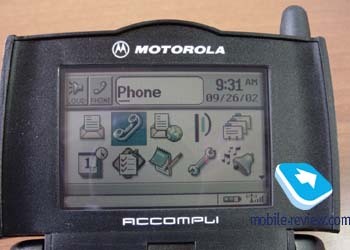 According to the manufacturers Motorola Accompli 009 is a communicator. It was elaborated as device to suit personal needs of user's. 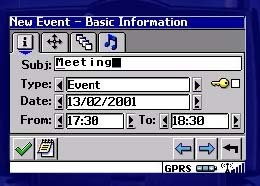 It's very helpful when organizing a day schedule, sending e-mail and SMS messages. All the phone peculiarities, for example, three bands support (GSM 900/1800/1900), are easily explained, the point is that this model is aimed, firstly, to corporative subscribers. The same ideas was used in v100, here you can see a similar squared design and phone construction. When you open it you can get an access to a screen and a keyboard. This phone is equipped by standard QWERTY keyboard, all the keys are small but well-spaced, what allows to input text quickly. Unfortunately, the keyboard has no backlighting, it is partly lighted by screen in the dark but it's not always sufficient. The phone is available in two colours: Silver and Radar Blue. Dimensions of the phone are quite compact - 97 x 71.5 x 27.1 mm, weight is about 167g. (communicator itself + a battery). The phone has a lithium-ion battery of 700 mAh capacity. According to the manufacturer it works 2-5 hours in the talking mode and 80-150 hours in the standby mode. Incase of 30 minutes of calling and 2 hours of other applications the phone worked about 1.5 day. It's a sufficient autonomy for devices of this class, don't forget about colour screen, which consumes much energy. The screen is common, it's not a touchscreen, TFT matrix shows only 256 colours. But in the whole it's not bad, the information is easily visible and colour makes the phone brighter. We have already paid your attention that under phone weight we meant only a weight of communicator with a battery. The standard kit includes also a portable handsfree, Plug-in Speakerphone and a holster. 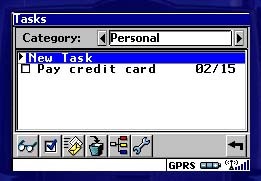 Besides, you can find there a desktop cradle, RS232 adapter and CD with a software. 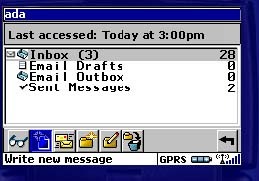 At first sight this device offers standard possibilities: viewing of PowerPoint 2000 presentations, sending and receiving e-mail (POP/SMTP) and others. 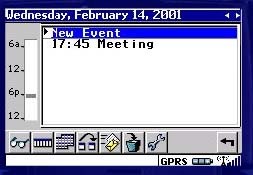 But it works under the latest Wisdom™ OS (version 5) from Motorola. Using of own OS allows to reduce effectively the size of execution code of applications and OS. On the other hand, this OS doesn't support some file formats, for instance, graphics recorded in JPG. But a user can convert all jpg files to ROB format. 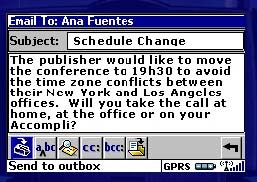 A calendar and organizer support data exchange with such applications as Microsoft Schedule+ 7.x, Microsoft Outlook 97/98/2000, Lotus Notes 4.5, 4.6 & 5.0, Lotus Organizer 5.0, 6.0, 97, GS/4.0. You can also send some of the notes, exchange business cards via IR-port. 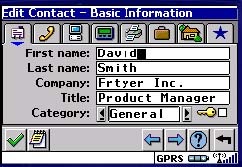 Synchronization software can be used in Microsoft Windows 95/98/2000 and Microsoft Windows NT 4.0 environments. Wireless synchronization is not supported. Few words about interface. There are several ways to navigate the menu, the easiest one is to use a group of keys - NavDisk. You move through the menu with a help of 4-directional key and select desired items by pressing right key. There are special keys to return in the main menu or to exit a current menu. 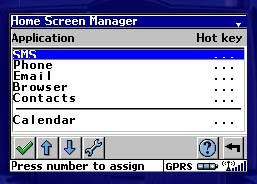 A main menu is a carousel-based interface. You can select any application as a home screen, all settings can be adjusted from the control panel. 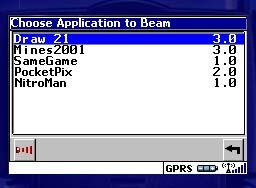 You can set a speed access for several applications. 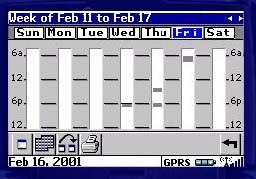 Certain keys can be used to access a calendar, organizer and a phonebook. You can find instrumental panels in all applications. They allow calling quickly necessary applications; it's easy to move through them with a help of NavDisk. Bookmark-pages are widely used in menu applications. It allows to divide the information on different categories. 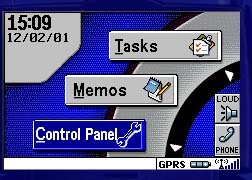 There are pulldown menu to select items, an interface of this model resembles computer interface greatly. 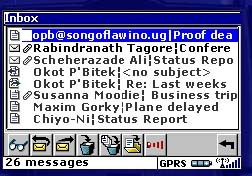 You also begin to compare this communicator with PC when you see a Recycle Bin on your deskptop, where all removed notes are kept. You can clean your Recycle Bin at the same way as you do on your PC. There is a global search of information in your communicator, you input the words and a communicator looks through all your files. We'll miss here standard features such as calculator, alarm-clock (up to 3), games (up to 5). There is a possibility to download extra software, but it's not widely spread. The company couldn't awake the interest of third companies to Wisdom OS. Limit of application memory is 4 Mb. Don't forget that part of it is used under pre-installed applications. User memory is also 4 Mb and Ram is 1Mb. Unfortunately there are no any possibilities to increase the memory. There are no external slots; memory cards are not available and it limits the possibilities of the phone. We can find many rival devices that have much more memory and which are compatible to many applications, but they lose in weight and dimensions. A great advantage of the device is GPRS (up 43.2 kbps). A shortcoming is limit of supported files formats. For example, you can't read any archive files. In the whole e-mail program is convenient if you need to send/receive only text messages. In the conclusion we would like to say that it is comfortable to have this device on your office table but not outside, it's very inconvenient to use portable handsfree every time when you want to talk. Vibrating alert is very strong. You can feel it even from the bag. Sound volume and the volume of the ringing tone is quite good. 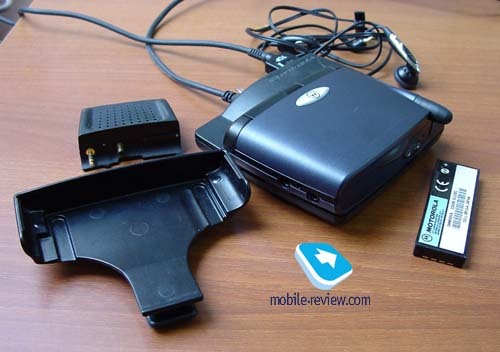 The quality of connection is average, there are many other business phones from Motorola, which have a better connection. It's handy that you can switch off the phone any time you want and use it only as PDA. I have controversial opinion on this device. On the one hand there are innovations here and on the other it has a small niche. It's not a reasonable purchasing if you pay 650 USD for this phone as there are many other devices, which have more advanced features and which cost the same money. Yes, form-factor is different, but it's not so important. We think that this phone would have the same fortune as Motorola v100, it wouldn't be demanding on the market.